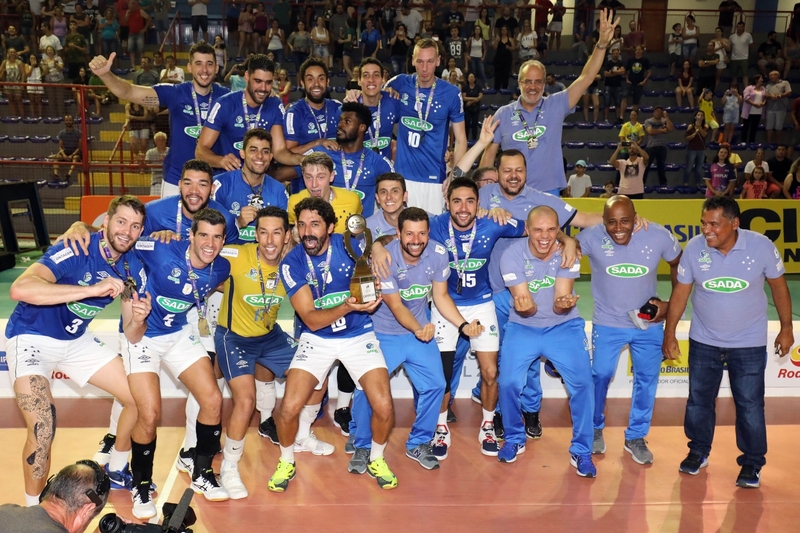 It was against Fiat Minas, in a regional classic match, that Sada Cruzeiro won its fourth Copa Brasil trophy and shouted “four-time champion!” On Sunday, January 27th, playing in Lages-SC (southern Brazil), the cruzeirenses beat their opponent by 3 sets to 0 and became a four-time Copa Brasil champion, adding 2019 to the 2014, 2016 and 2018 achievements. The team, led by Marcelo Mendez, had a very balanced beginning, but then they dictated the pace of the game at the Jones Minosso gymnasium and scored 29/27, 25/22 and 25/22. 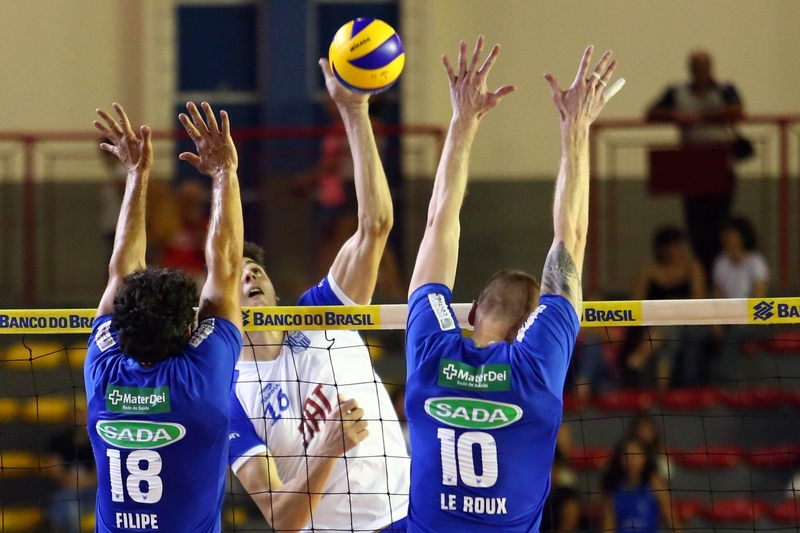 Sada Cruzeiro is used to playing games in the Campeonato Mineiro (a regional tournament), which results in nine straight titles for the blue team in duels against Minas. For the first time the clubs faced each other in a national championship final. This trophy, the first consecutive champion in a Copa Brasil, was much celebrated by the reformulated team of Sada Cruzeiro, which maintains its hegemony in the national scene. “Our team had great changes this season, but the thirst for winning and the desire to be on top of the podium remained. This title is the result of the team’s work. The whole team deserves to be congratulated, a lot of people doubted us, for all the changes we had, but we showed that we are still on top. It’s wonderful for me to know that this team continues to be a winning team, and everyone who comes through feels a bit of that energy,” said captain Filipe. And the victory was really a conquest of the group. Setter Fernando Cachopa did a great job in the match, distributing the blue attack very well, which had Evandro as the highest scorer, with 13 points. As for Minas, Davy was the highlight, with 10 points, the same score as cruzeirense Taylor Sander. “We knew it was going to be a tough game, because Minas had been doing quite well in the last matches, eliminating two strong teams (Sesi-SP and Taubaté) to get to the final. However, our team did a good job, we were very focused, and we are going to take this important trophy home. We are all to be congratulated”, said coach Marcelo Mendez. The fourth Copa Brasil trophy raised by Sada Cruzeiro in Lages-SC represents the 33rd title in the 38 finals of a total of 43 championships the team has played since 2010. Sada Cruzeiro – Fernando Cachopa, Evandro, Rodriguinho, Sander, Le Roux, Isac e o líbero Serginho. Entraram Luan, Sandro, Filipe and Leozinho. Coach – Marcelo Mendez. Fiat Minas – Marlon, Felipe Roque, Bob, Honorato, Flávio, Pingo e o líbero Rogerinho. Entraram Davy, Maique, Piá and Winck. Coach– Nery Tambeiro.